I currently work for Living Direct, Inc. in Austin, Texas. Living Direct runs a network of sites including Compact Appliance, WineCoolerDirect, Kegerator.com and AllergyandAir.com. They also manufacture the EdgeStar, Koldfront and Avallon line of appliances. The company specializes on appliances geared towards living life on a smaller, greener footprint. The tiny house set is a particularly good fit for much of the product line. Some fun appliances like wine refrigerators and kegerators are also sprinkled into the mix. Now that the mundane introduction is out of the way, let’s get to the fun part, giveaways! Monthly giveaways typically take place on 2-4 of the network of sites. Compact Appliance typically has an Avanti microwave up for grabs. WineCoolerDirect usually has a thermoelectric wine cooler in the 16-24 bottle capacity. Kegerator often has a TBC50S mini kegerator, but sometimes even has full sized kegerators. Allergy and Air commonly has an air purification unit. This month there are three giveaways. 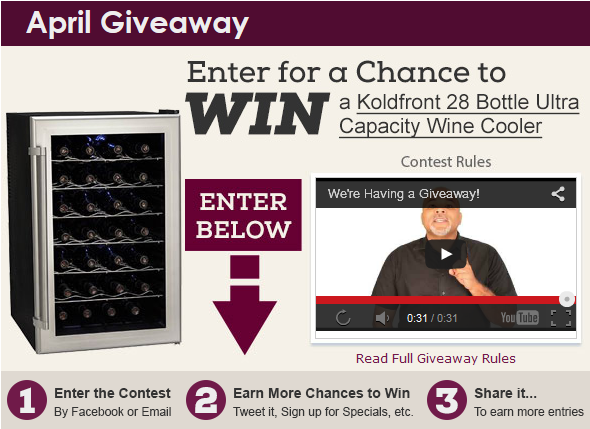 The July giveaway is a for a Koldfront TWR282S 28 bottle thermoelectric wine refrigerator. This unit currently costs $199.99 on the site. TWR282S has a 3.5 star rating on Amazon with 26 reviews. A common theme pervades the negative reviews. Consumers don’t understand the limited cooling capacity of a thermoelectric wine fridge versus one with a compressor. A thermoelectric wine fridge is only capable of lowering the ambient temperature about 25 degrees at most, and it doesn’t lower the temperature as quickly as a compressor cooled unit. A major benefit of thermoelectric cooling is quiet operation. 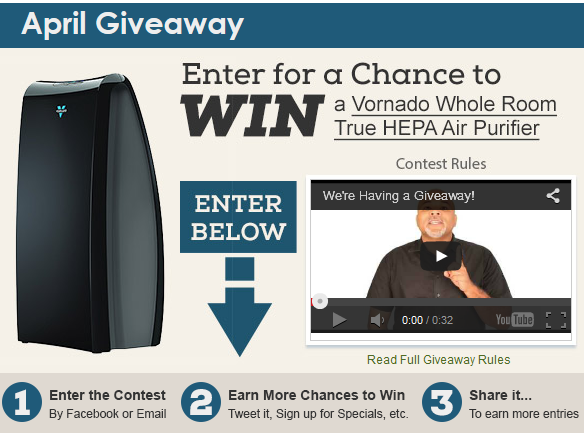 The AllergyandAir July giveaway is a Vornado AC500 true HEPA air purifier. This unit currently costs $249.99 on the site. AC500 Vornado air purifiers come with a 5 year limited warranty. Reviews on Amazon are stellar with a 4 star rating from 28 reviews written. This really is a great giveaway for anyone who has allergy problems or simply wants cleaner air. It doesn’t look like this giveaway has been renewed for July. The Compact Appliance giveaway this June is for a .7 cubic foot Avanti microwave. I scratched my head the first time that I heard this was the most popular giveaway product. When I thought about it more, it makes sense. Everyone I know has a microwave, while relatively few people have air purifiers or kegerators. Realistically, any free item of value is a good item in my book. What the hell, I’ll give it away or sell it if I don’t like it. Giveaways on Kegerator.com aren’t on a monthly basis like with the other Living Direct websites. 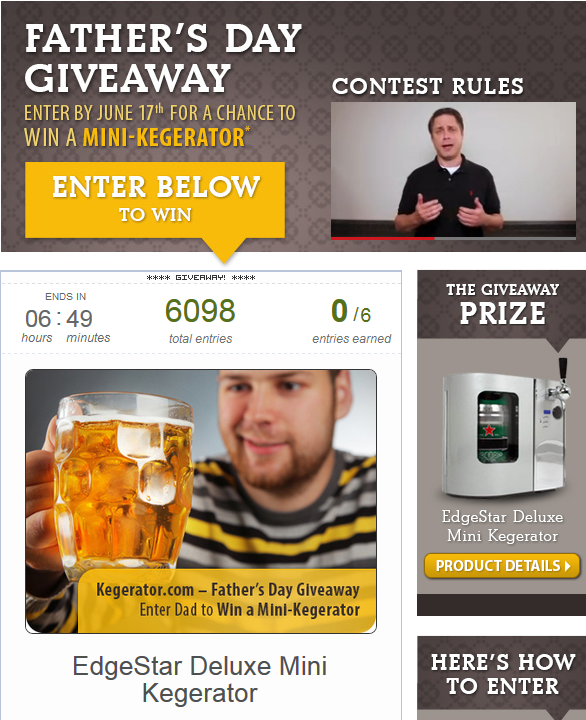 They do tend to have a Father’s Day giveaway every where where they giveaway a mini kegerator. These TBC50S mini kegerators can be a great deal if you like the taste of draft beer but don’t want the annoyance of having a full sized kegerator in your house. If you are like most men, it is probably more accurate to say if your wife doesn’t want the annoyance of a full sized kegerator in your house. Hopefully you find the prizes up for grabs interesting. Good luck!